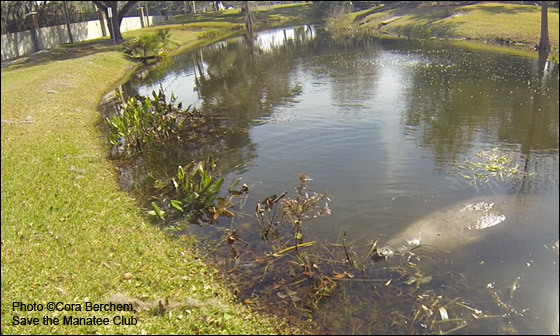 On February 13, 2016, there was a report by citizens of a manatee in shallow water at Venetian Gardens in Leesburg (adjacent to Lake Harris). 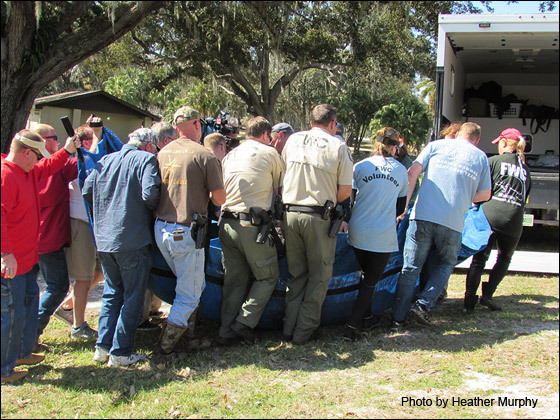 A team was mobilized and the female manatee, named “Leesburg,” was rescued on Valentine’s Day, February 14th. 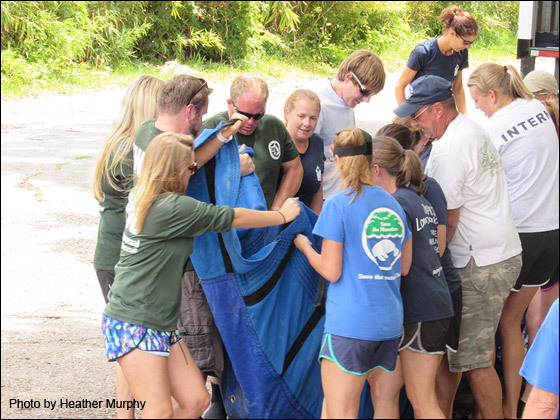 Above, the rescue team members deploy a net and draw the manatee slowly to the shore. 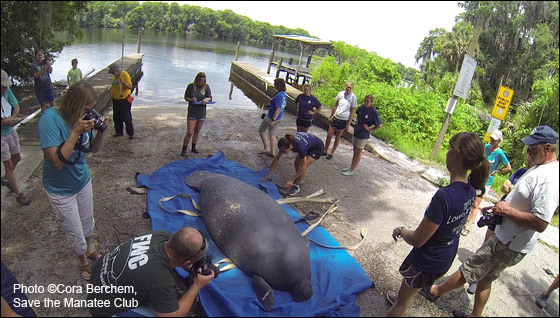 After her capture, Leesburg is carried to the truck by the rescue team comprised of Florida Fish and Wildlife Conservation Commission (FWC), Sea2Shore Alliance, and Save the Manatee Club staff and volunteers. Many thanks to everyone who helped! In spite of their size, manatees have relatively little body fat and cannot tolerate water temperatures below 68° F for long periods of time. Leesburg suffered from severe cold stress and had white lesions all over her body. 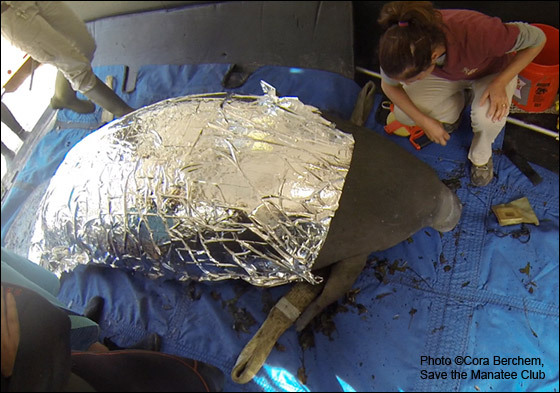 Above, a thermal blanket is placed over Leesburg to warm her. Leesburg was transported to Lowry Park Zoo where she received treatment. At first Leesburg had to be tube fed, because she wasn’t eating enough and was also dehydrated. At the time of her rescue, she weighed 1080 pounds and was nearly 9 feet long. Release day! After three months of rehabilitation at Lowry Park Zoo, Leesburg is ready to be released on May 11, 2016. She now weighs 1,100 pounds. 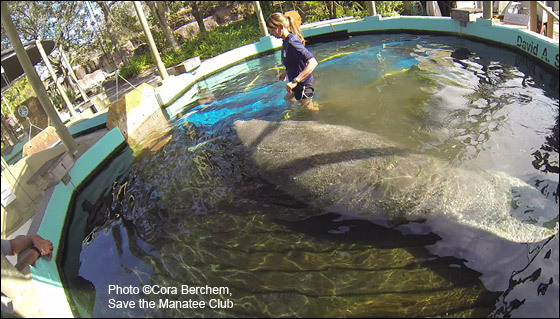 Above, she is unloaded from the truck by FWC, Sea2Shore Alliance, Lowry Park Zoo, and Save the Manatee Club staff and volunteers. 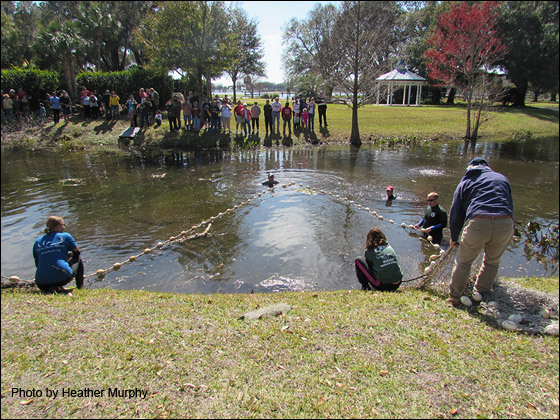 Leesburg was released back out into the wild into the St Johns River at the Shell Harbor Boat Ramp in Welaka, Florida. Above, her scar patterns are documented, and she is prepared for release. If you look closely, you can see cold stress scars on Leesburg’s back. Skin lesions are often associated with cold stress. Leesburg is released. She has been tagged by researchers from the Sea2Shore Alliance. 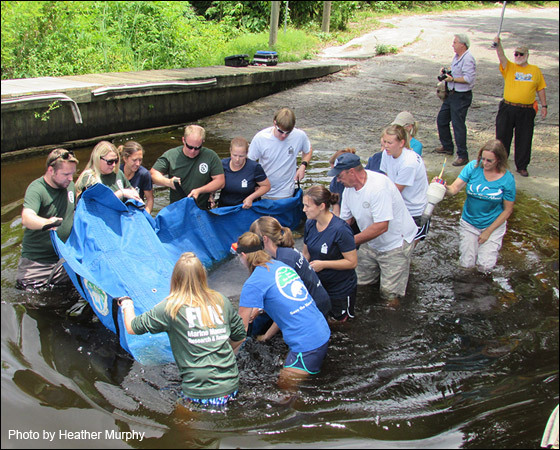 “Sea2Shore Alliance just began their manatee use research study in the Ocklawaha River, and we were fortunate to have the opportunity to tag Leesburg as our first study animal,” said biologist Monica Ross. 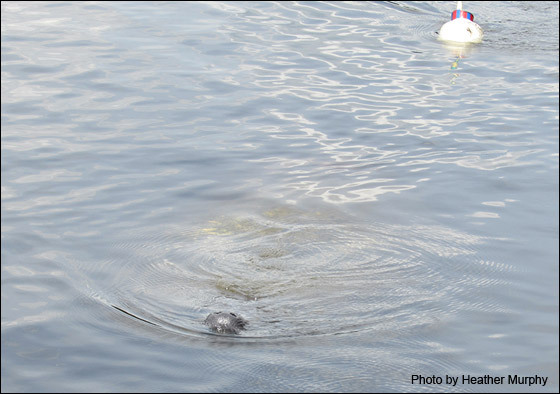 You can see the tip of Leesburg’s snout as she surfaces to breathe and her floating tracking device at the top of the photo.Two days after her release, researchers from Sea2Shore report that Leesburg had gone through Buckman Lock and was observed feeding and socializing with other manatees. 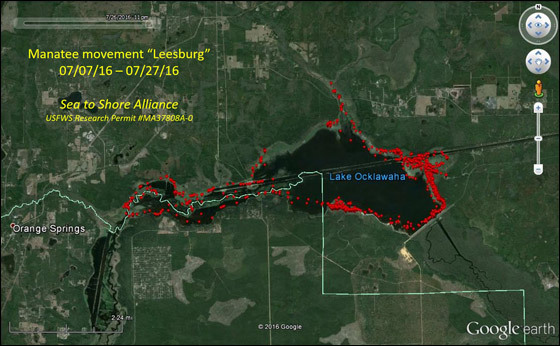 In July, she was still using areas in Lake Ocklawaha and the reservoir and made a quick round-trip halfway to Eureka, Florida, and another trip through the lock to Welaka. See a map of her movements below. She has been routinely observed with other manatees. Good luck Leesburg! 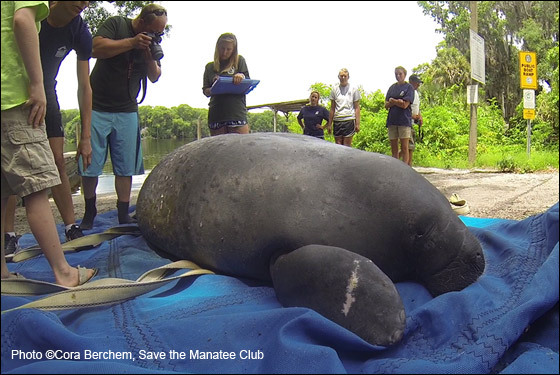 Download 2015 Manatee Mortalties, a sheet with statistics from 2015 and information on how to report an injured manatee (pdf).